The U.S. e-commerce giant Amazon Wednesday said it launched Turkish online shopping platform for 15 categories of products. 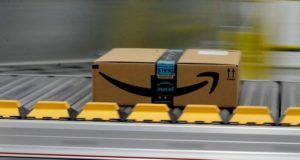 “Since the launch of Amazon.com in 1995, hundreds of thousands of Amazon customers in Turkey have ordered millions of items from existing Amazon stores around the globe,” Amazon’s country manager for Turkey, Sam Nicols said in a statement. Turkey with close to 80 million people becomes the global e-commerce giant’s European market outside the European Union (EU). Turks can purchase a range of products across 15 categories including books, electronics, toys, and more on www.amazon.com.tr. The controlling shareholder of the company is the Luxembourg-based Amazon Europe Core S.à r.l., Daily Sabah reports. Amazon.com Inc. became early this month, the second U.S. company to hit a market capitalization of $1 trillion. Posted by KanelkaTagba on Sep 19 2018. Filed under Headlines, World News. You can follow any responses to this entry through the RSS 2.0. Both comments and pings are currently closed.